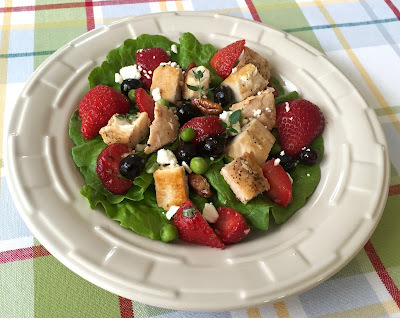 This salad with fresh seasonal strawberries turn this meal into a summer sensation! Combine 1 tablespoon oil, vinegar, honey, thyme, 1/8 teaspoon pepper, and an 1/8 teaspoon salt in a medium bowl. Stir with a whisk. Add one cup of the strawberries, blueberries, and pecans, tossing to coat. Set aside. Heat remaining 1/2 tablespoon olive oil in a skillet over medium-high heat. Sprinkle remaining 1/8 teaspoon pepper and 1/8 teaspoon salt over chicken. Add chicken to skillet and cook 3 minutes on each side or until done. Remove from skillet and let stand 5 minutes. Cut chicken into cubes. Divide lettuce between 2 plates or bowls. Add chicken to lettuce and top with strawberry-balsamic mixture. Add some of the remaining fresh strawberries as well, along with about 2 tablespoons of feta cheese on each plate. Enjoy! If you'd like a printer-friendly version of this recipe, Click Here.